BCIT-FCCLA, a chapter of Family, Career and Community Leaders of America (FCCLA), joined 120 student leaders and advisers on Capitol Hill in Washington, D.C. from Wednesday, Sept. 28 through Saturday, Oct. 1 to participate in FCCLA’s Capitol Leadership meeting. BCIT Westampton High School senior, Destiny Montgomery, represented BCIT. During Capitol Leadership, students received training focusing on networking, professionalism, strategic planning and advocacy around key teen-centered current issues. 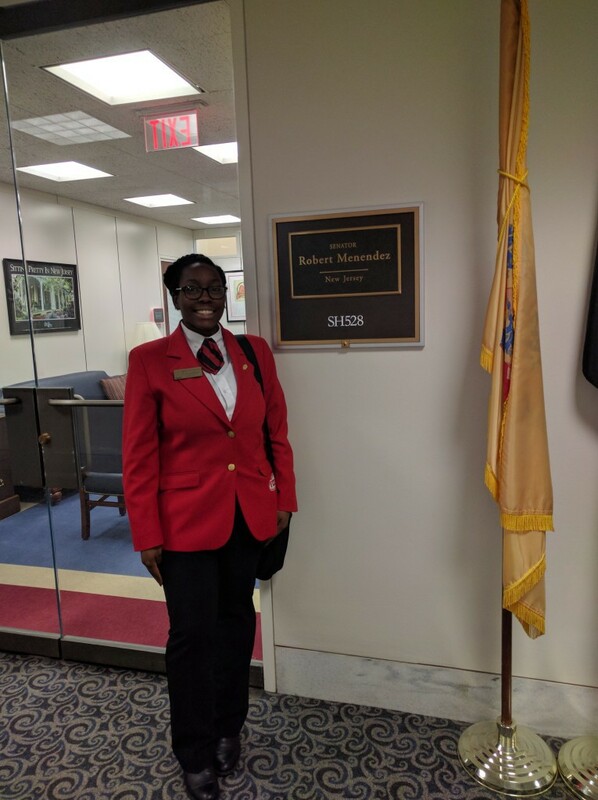 Students put their training into action by meeting with Congressman Donald Norcoss, Congressman Tom MacArthur, Senator Cory Booker, and Senator Robert Menendez to advocate for Family and Consumer Sciences education and Perkins Funding. BCIT FCCLA student Destiny Montgomery articulated to Congressman Donald Norcross staffer Vincent P. Sarubbi Jr. how their support for education impacts teens who are preparing to be in college and career ready. “I believe Career and Technical education and an organization like FCCLA is a great benefit to teens like you. It prepares you for your future, I wish I was prepared for my future as much as you are when I was your age.” said Vincent P. Sarubbi, Jr.
Students also had the opportunity to participate in several strategic events that highlight youth concerns and raise community awareness. BCIT FCCLA student focused on the obesity crisis by participating in a special-event screening of The Student Body — a film that tackles the topic of childhood obesity and how youth can use their voice to help adults better understand the impact their decisions have on teens. Additionally, students participated in a Teen Road Safety Assessment (RSA) to highlight the importance of traffic safety– with traffic crashes being the leading cause of death for teens. Recommendations from their conducted assessment will be reported and considered for opportunities for improvement. Capitol Leadership was the first of several large gatherings FCCLA will host throughout the 2016–2017 school year to provide similar opportunities to students around the nation.